By now, you might have heard a few whispers here and there about the "Great American Eclipse" that will happen on August 21, 2017. It’s kind of a big deal because it’s the first eclipse to pass entirely across the U.S. in over a century. It will start in the Northwest and leave the U.S. in the Southeast, which makes eight U.S. states in diverse regions of the country prime for viewing this natural phenomenon. What exactly is an eclipse? In case you don’t remember your elementary school lessons, a solar eclipse happens when the moon lines up directly between the sun and the earth, essentially blocking out the sun’s light. Down here on earth, we’ll be plunged into total darkness if we are located on the path of totality. 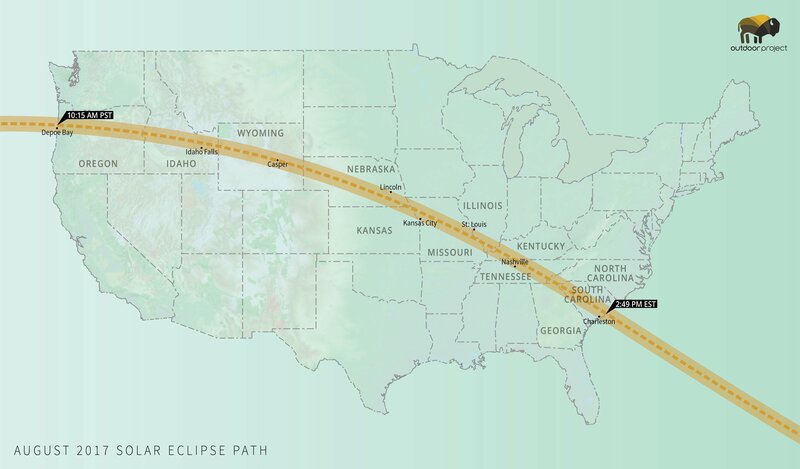 The path of totality describes the path with the best vantage of the solar eclipse. Those in the path of totality will see the moon totally cover the sun, whereas the rest of us will see a partial eclipse and not experience complete darkness. According to experts interviewed by Newsweek, viewers will get to watch the moon cover the sun for about 75 minutes, be fully covered, and then seemingly move off the sun for another 75. Don’t stare directly at the sun throughout this time period, though. Even though it will be dimmer than normal it can still harm your eyes. So where is the path of totality? The path runs from Oregon to South Carolina, and areas away from city lights will have the best viewing opportunities. Be warned, however, many of these areas are already booked and are expected to be packed with eager viewers. Millions of people from around the world will be traveling to destinations throughout the U.S. for their chance to catch a glimpse of this event, so plan accordingly! Where can I see a partial eclipse? Maybe crowds aren't your thing? There's no shame in heading away from the path of totality and enjoying a little more peace and quiet. While everyone else sets up camp during the weekend in preparation for the Monday show, break out on your own for some amazing adventures. While a total eclipse is an amazing sight to see, there are plenty of ways to view a partial eclipse by venturing on the outskirts of the totality path and beyond - did you know that no matter where you are in the continental United States, you will enjoy some version of the eclipse! Ultimately, it all depends on what you're looking for and how many people you'd like to share this phenomena with. For some great adventure ideas to make the most of a partial eclipse in August, we've compiled some of our favorite weekend trips and adventure ideas from around the country for you to enjoy! Adventuring or not, no matter where you are on Monday, August 21, just remember to look up and enjoy a wonderful day in the great outdoors - be safe, have fun, and happy trails!